So you’re coming to town with a pet? Fear not, there are many pet-friendly hotel havens among Orlando’s seemingly innumerable lodging choices. Some are posh, some budget-friendly, some are even free! 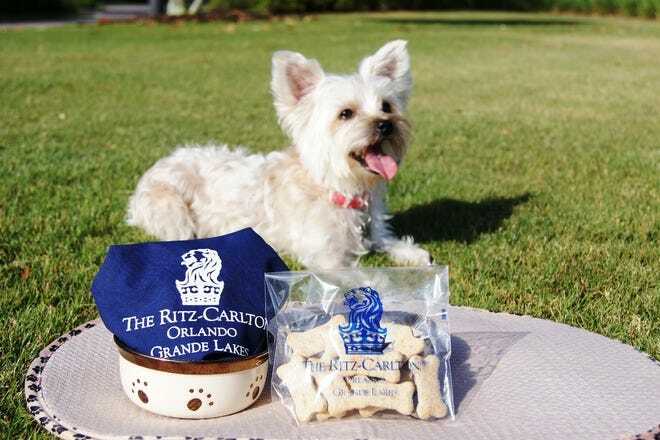 If you’re looking for the finer things – and ritzy take-home trinkets both literal and figurative – perhaps you and your designer dog should check into the Ritz-Carlton Orlando, Grande Lakes, where the name says everything you need to know about the accommodations. 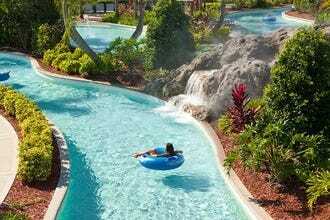 For Universal-convenient stays, the choices are a’plently on site and off. 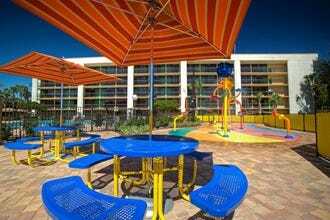 All three of Universal Orlando Resort’s deluxe properties are proponents of the Loews Loves Pets program. Not surprisingly, your pet even enjoys its own room service menu. For budget-friendly digs, consider the convention center-convenient La Quinta Inn & Suites. Much like the Universal properties, it’s also pretty convenient to the Dr. Phillips Community Park’s dog park, a lovely playground with areas for small and large pooches, shade and plenty of fresh water. Downtown doggies will delight in the sleek, stylish Aloft Orlando Downtown, where the ARF program offers everything from treats to toys for the whopping price of not-one-thin-dime. Walking distance to Lake Eola Park (no off-leash areas, but there’s great al fresco space at the World of Beer’s dog-friendly patio, among others) make it an even more enticing option. 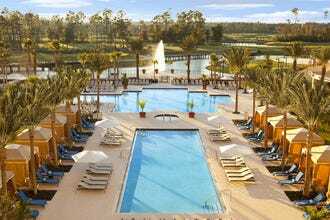 Fancy Fidos and kitties looking to get ritzy can check into the tony Ritz-Carlton Orlando, Grande Lakes when they visit the City Beautiful. Weight restrictions limit furry guests to 25 pounds or less (one per room, please) and the fancy placemat, food bowl and treats are yours to keep. A fancy logo-emblazoned bandana will let friends at the dog park back home know that everyone â" including the family pet â" enjoyed their stay. There's a one-time cleaning fee of $250 per room for the pleasure. The rolling, green grounds around this property are lovely, making walks especially enjoyable for everyone involved. Red Roof Inn is a brand well known for value and with stays under $100 a night â" with kids under 17 and pets free of charge â" this property stays true to its reputation. With complimentary scheduled transport to the area's best-known theme parks and a location convenient to the Orange County Convention Center as well as the many shopping, dining and entertainment options of International Drive, guests who are doing multiple daily dog walks will certainly have much to explore on their outings. Free wifi and flat-screen televisions are two other amenities you'll find at this 100 percent smoke-free property. 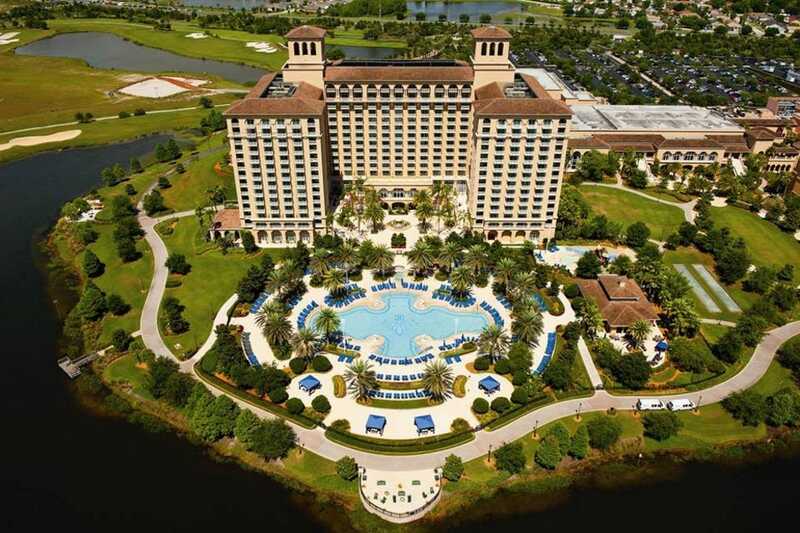 While the beautiful Hyatt Regency Orlando does not allow its four-legged guests access to the pool area, it does keep its dog-walking stations stocked with fresh water when guests with pets are in the house. Pets are welcome for up to six days for a flat fee of $150 applies (additional charges apply for stays exceeding six days) and they receive lots of love (and more than a few treats) upon check-in. Staffers report they particularly enjoy when the nearby Orange County Convention Center is hosting a dog show and the lobby becomes a parade of pooches coiffed for competition! Let the serenity of the South Seas wash over you and your fur baby as you're both enveloped in the hospitality of the Loews Loves Pets program. Spike can even enjoy the grounds while you're at the parks; just take advantage of your host property's pet-sitting and/or dog-walking services and you'll know he's happy while you're wide-eyed at the Wizarding World. Other amenities include pet placemats, food/water bowls, toys, treats and more. A chef-crafted, veterinarian-approved menu of meals and goodies is available via room service; yours will be among the best-fed tourists on four legs. 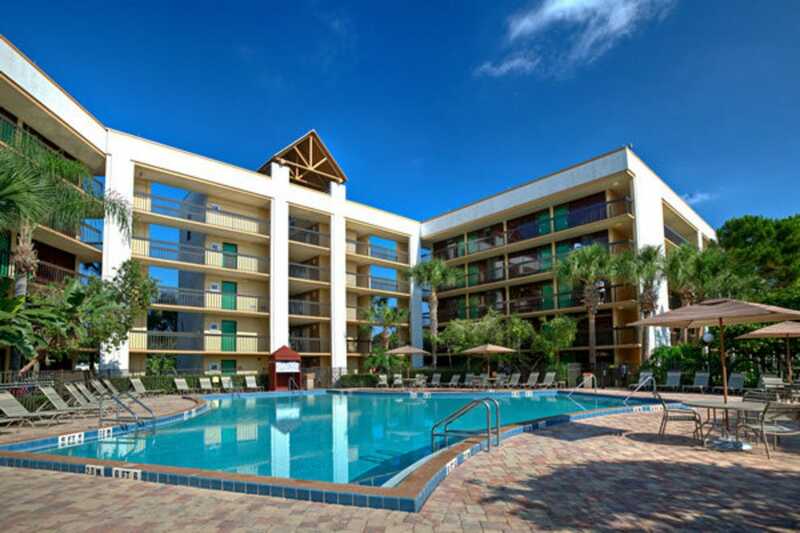 Loews properties limit pets to two per room. It's where your pet can party like a rock star, too (as long as he or she is a well behaved Grammy-winner). They'll be happy to lend you a litter box or scratching post for your puss-in-combat-boots. 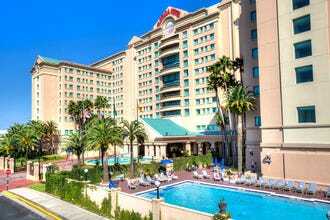 The Loews Loves Pets program is in effect here, as well â" along with its sister deluxe properties at the Universal Orlando Resort. Spot and Mr. Whiskers will receive a welcome letter from the General Manager upon check-in, along with an area map on which dog-walking routes are highlighted. Need something? You'll likely find it in your room amid an amenity complete with pet placemats, food/water bowls, toys, treats and more. And if you're short on kibble, rooms service will deliver dinner â" hot and/or cold entrees! â" right to your door. Petite pets of 17 pounds or under (we're looking at you, designer purse dogs!) 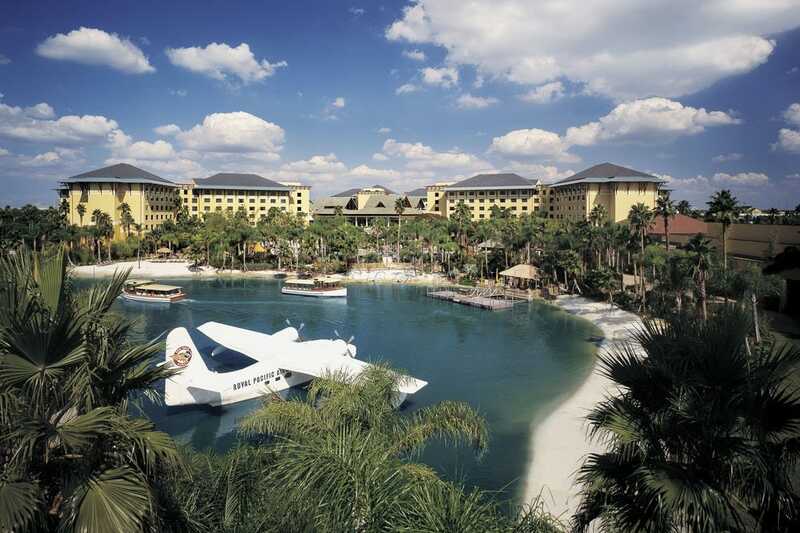 are primed for a luxurious experience at the Four Seasons Orlando Resort at Walt Disney World Resort. In-room bowls and a sumptuous "Pampered Pets" room service menu ensure they'll feel welcomed. From the "Haute Diggity Dog" (scrambled eggs, rice, veal stock) to the "You're Kitten Me" (boiled chicken and steamed broccoli) your spoiled pet will be as delighted as you are amused. 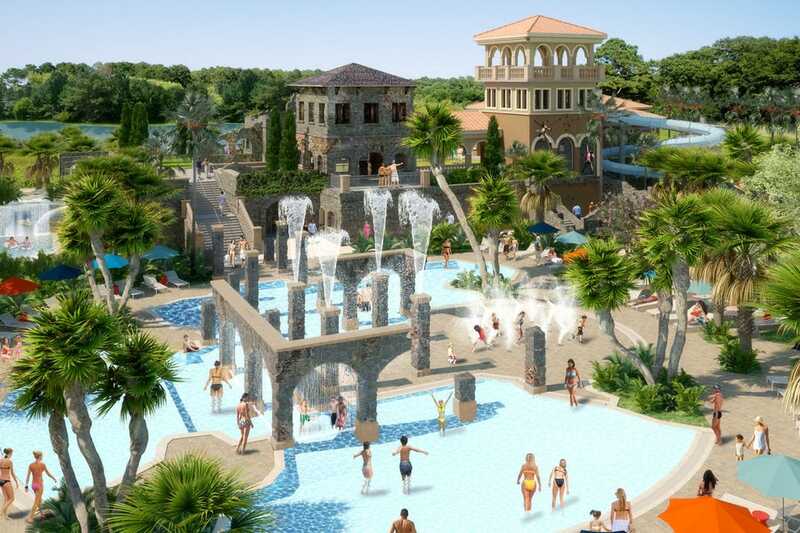 Beyond the dog- and cat-centric, of course, it's a Four Seasons, where happy owners, too, luxuriate in amenities like the pools (one ideal for families, the other just for grown-ups), top-tier restaurants, sumptuous spa and superb views of the Disney fireworks. Clean rooms, great rates and perhaps best of all for pet owners: no fees! Not at this super-Universal-and-convention-center-convenient location or any of this brand's other properties. 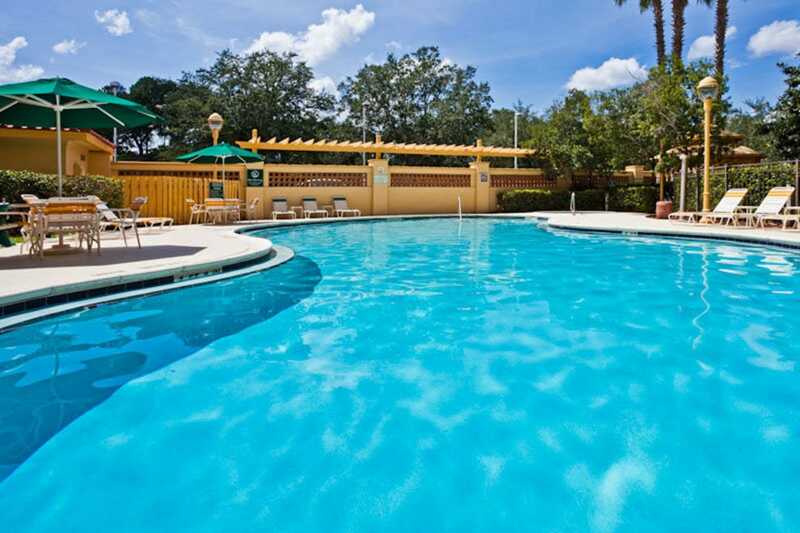 The La Quinta Inn & Suites Orlando Convention center accepts a maximum of two pets per room, but there are no weight restrictions (for other properties, its best to call as policies may vary). You'll need to remember your furry friends' food, of course, but come the morning, its human guests can enjoy a free breakfast after their mandatory morning walks with Rover. Free high-speed Internet access means you'll be able to research local pet-sitting and walking services if need be (or peruse the city's many pet-friendly restaurants)! 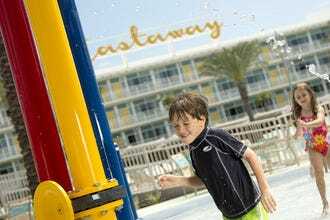 A colorful-fun splash zone and 24-hour arcade are among the family-friendly amenities that make this Rosen Hotels property a Disney Good Neighbor Hotel, but its offerings extend to the pet-friendly as well. 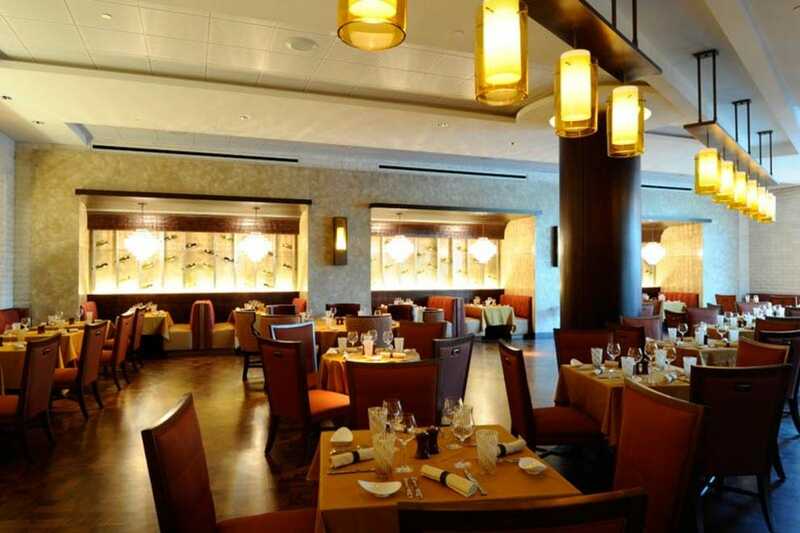 In fact, Rosen's entire Orlando portfolio welcomes pets, but Clarion's policies are among the most welcoming. 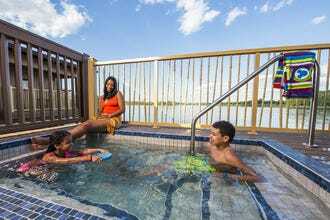 Two pets of up to 50 pounds each can stay alongside their human family members and a super-reasonable pet fee (just $15 for each animal) make the Clarion Lake Buena Vista an affordable option, as well. 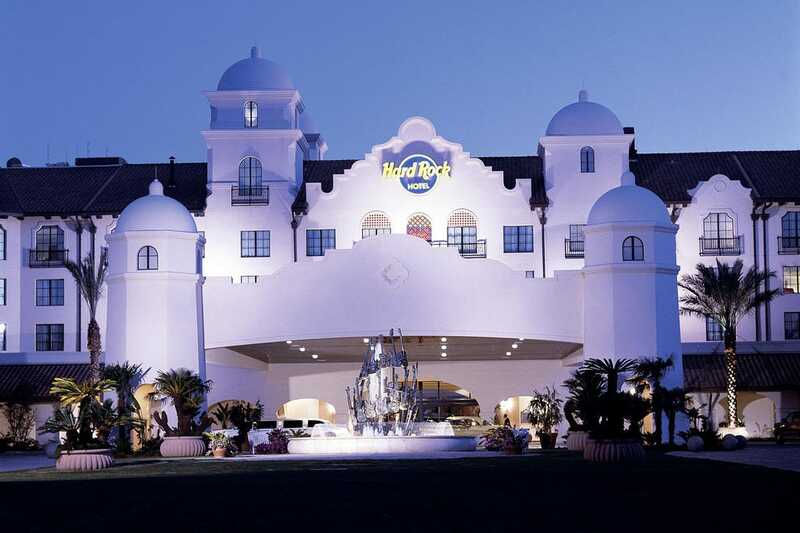 What's more, they offer a VIP Pet Package with waived fees, special rates and other benefits on select nights! Check their website for more information. 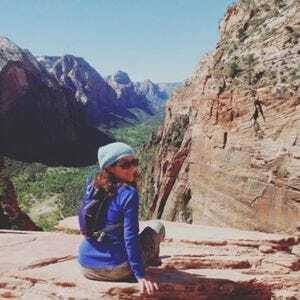 Since the introduction of the Loews Loves Pets program some 15 years ago, the brand has hosted many beloved beasties in its properties around the US. 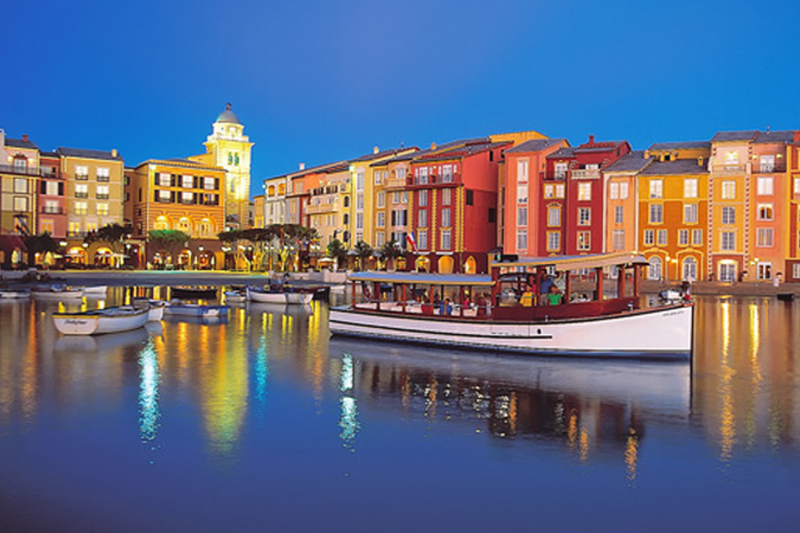 The Loews Portofino Bay Hotel at Universal Orlando Resort is no exception. In fact, kitties and puppies even received a welcome letter from the General Manager upon check-in, along with an area map on which dog-walking routes are highlighted. Need something? You'll likely find it in your room amid an amenity complete with pet placemats, food/water bowls, toys, treats and more. And if you're short on kibble, rooms service will deliver dinner â" hot and/or cold entrees! â" right to your door. Orlando properties charge a flat pet fee of $50 per day ($150 maximum). 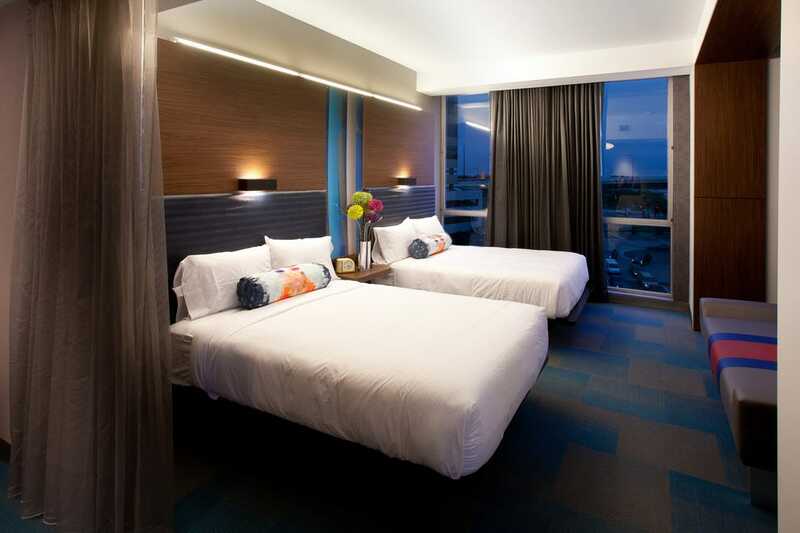 The Aloft Orlando Downtown is clean, bright, modern and colorful and despite your furry best friend's lack of appreciation for the latter, he or she will greatly appreciate the brand's ARF program! 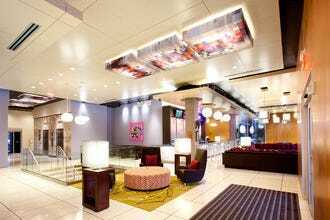 Aloft extends the "friendly" part of its pet-friendly policy to your wallet. What does that mean? No fees. Zip, zero, none. Guests with pets will be required to sign a waiver and once this formality is done, both you and Fido will appreciate the special bed, bowl and doggie back of "woof-alicious" treats upon check-in. Even dog toys! Pets over 40 pounds need GM-approval; call ahead to discuss if need be.